Learning team dynamic is a liberating and, at times, a painful lesson. Team dynamic is a key aspect of our organization’s approach to third world development. It refers to the dynamic that forms in a team according to the competencies, capacities, and relationships of a group of people with a shared goal (for more on the subject read HERE). For me, my painful lesson came in 2006, when I was 16 years old. Soccer games on Summer Internship are more than just a game. They’re an opportunity for participants to learn how they can work together to accomplish a shared goal - an essential component of our development work. I was in Guatemala on my first internship with Students Living A Mission (SLAM). 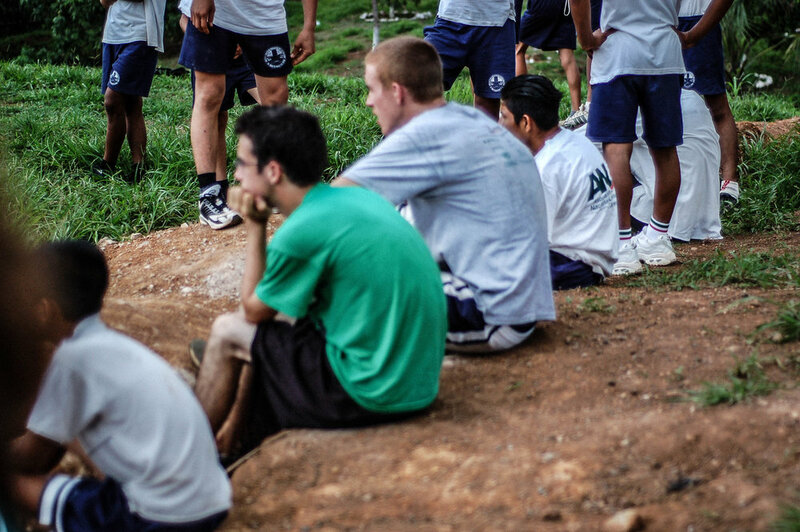 One day we were playing a soccer game with a local school just up the road from where we were staying. The team leader, Gregg Garner, was prepping us for the game and discussing strategy and positioning. Having no experience with soccer, I was just excited to play and be a part of the team. While I knew that I wasn’t going to be the star of the team or really even a positive contributor on the field, I was listening to hear my position. My culture was telling me that even though I might not be good enough to play, I still deserved an opportunity to play. And while I did get an opportunity to play, it went about as well as expected. I was getting knocked around, constantly out of position and, in every way, doing more harm than good for our team. After about 2 minutes of play I was subbed out. I was a little shocked and embarrassed because though I knew I was doing poorly, I still felt like I deserved to play longer. So there I was, sitting the bench and feeling sorry for myself because I wasn’t playing. At the same time, the ball was kicked way over the goal down the steep hill behind it (something that was stopping play frequently). Gregg came up to me and said, “Nick, go stand at the bottom of the hill and throw the ball back to us so we don’t have to wait so long every time it goes down the hill.” While I wish I could say I responded with understanding and humility, my pride took over and I was struggling to see the value of what I was being asked to do. Immediately after the game Gregg talked to me about how the body of Christ is not made strong by people that are naturally talented or skilled, but it is built up by everyone doing the role the Lord has called them to with faith and confidence. He encouraged me that I wouldn't always have that role. He told me that I would grow and be on the field soon enough, but until then and even then, it was about my character, attitude, and faithfulness in the little things that would be measured by God. It was through that moment I was taught the real meaning of team dynamic. Developing team dynamic requires truth, humility, honesty and selflessness to see a team thrive. It requires a willingness to play less glamorous positions so a team can succeed together. There will be humbling moments, but when a team can find their dynamic, it makes for a powerful group of people that the Lord can use in incredible ways. Using the Strengthfinder test, Nick helped identify each staff and volunteer’s gifts and discuss the ways that they can work together for the benefit of the whole. Earlier this month, I traveled to India with India team members Jeff Sherrod and Rachel Nowlin. During our trip, one of our primary goals was to enhance the team dynamic among our cooperatives and volunteers. We facilitated a Strengthfinder workshop where cooperatives and select volunteers took the personality exam and received their top 5 strengths. This exercise allowed them to put words and thoughts to the strengths and weaknesses that everyone might recognize in each other, but didn’t have a platform to speak about directly. It was an impactful time because everyone could talk honestly about the things they see themselves do well and have confidence in doing. We talked about how people can continue to develop their strengths and also how their strengths interact with each other. It was important to show that they all had something to contribute and that no one’s strengths were lesser than someone else's. Pradip, a new volunteer with G.O.D. India, reflected upon his top strength (“Includer”) by saying, “Reading the description of Includer made me so happy as I thought of all the ways I have naturally been doing this my whole life. I have always felt the need to make sure people feel included and needed in whatever project or group I was leading at work or in church.” Reflecting on the strengths the Lord has been developing in them, we could identify the unique and special dynamic that they had already been developing together. Learning team dynamic is a liberating, and at times, painful lesson. The pain comes from the moments of humility and self denial that help to form you into the body of Christ. The liberty comes when you find full peace and confidence in the gifts and roles the Lord has prepared for you. When you find this assurance in the Lord, you are free from comparison and jealousy because you know you are on a team where every role was given by God and no person is greater than another. And when you really begin to understand this dynamic you can find joy and satisfaction in every moment, whether you are scoring the winning goal or standing at the bottom of a hill waiting for the next ball to go out of bounds.